The Bucky Five: Cowboys at Packers ~ The Bucky Channel - The World of Sports from Wisconsin's Perspective. 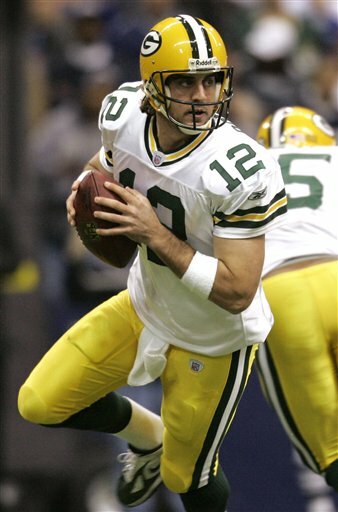 Still trying to figure out how this became the definitive photograph of Aaron Rodgers' young career, but whatever. Here are five things to watch for during Sunday night's game against the Cowboys. This could really be one of the league's best rivalries over the next couple years, if both teams continue to compete. It's still a shame they didn't get to match up in the NFC Championship game last year, but that was only because the Giants had to ruin everything for a two month stretch there. Despite the many losses to the Cowboys over the years, one thing the Packers have not done is lost to the Cowboys at Lambeau Field. They are 5-0 against them at home over the years, and I think that's a trend that will continue. If the Cowboys truly are the class of the NFC, the Packers are right there behind them, and do have the homefield advantage. I guess all you have to do in this league is have two good games back-to-back and everyone loves you. But you can't argue one bit with the way Rodgers has played so far, and I'm not the only Packers fans who wonders what our record would be if we still have Favre. Seriously, did you see how OLD he looked on Sunday? You know that things are going your way when the biggest Packer Hater around, ESPN's Tom Jackson, has already anointed Aaron Rodgers as his early season MVP. Rodgers played well against the Cowboys last year, but as the analysts will tell you, that's because the Boys had anticipated for Brett Favre. But as we've seen, Rodgers plays like Favre minus two categories. 1) He's mobile. 2) He's good. Sorry, that was stupid. And probably a tad offensive. But it's homecoming weekend for Romo, who attended high school in Burlington (special shout-outs to Phil Dinges and Andy Overturf are necessary here). I don't remember where I read it, but apparently this homecoming isn't that big of a deal for Romo, who says he's only been to Lambeau twice (once for a pre-season game as a fan, once as the 3rd string QB). Out of all the great athletes that have come out of Wisconsin, I can honestly say I feel least connected towards Romo. I don't know, I just feel like he's not a true Wisconsinite. He never seems to embrace us in interviews, and didn't really spend too much of his life here, anyways. But the point of this point is that we need to pressure him to win. 2. Defense wins Championships (and Week 3 matchups). We already know what both offenses bring to the table. We saw the Cowboys D get torched by the Eagles on Monday night, and we saw the Packers struggle against Calvin Johnson for awhile on Sunday. The key to this game isn't going to be into the much-hyped battle between the QB's, it's going to be between the defenses. Frankly, I think ours it better. So I hate to be all Emmitt Smith about this, but really, who ever scores the most points is going to win this game. 1. See You in January. Some people say it's a shame such a good matchup has to take place so early in the season, but I say what better way to gauge where your team is at than playing a fellow Super Bowl contender in week three? Sunday Night, under the lights, at Lambeau, all day to tailgate, what's not to like about this? It will be a great tune-up for when the Packers invite the Cowboys back in January, for the NFC Championship. Unless the Giants ruin things again.